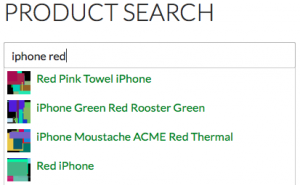 The WooCommerce Product Search extension brings Search Relevance and Instant Search Results to WooCommerce. The extension helps to improve and control the relevance of products in search results and adds facilities that supply instant results helping visitors to find products faster. The relevance of search results is substantially improved with powerful controls that introduce Search Weights to WooCommerce. These have an important impact on product search results, where products will rank higher according to their relevance, based on keyword matches in product titles, excerpts, contents and tags. In addition, new controls are provided to increase the relevance of individual products along with those of whole product categories. The extension also provides a live search facility, where product search results are shown instantly to visitors while they type in their search query. This reduces the time that potential customers require to find products and can increase sales substantially. The extension comes with a shortcode, widget and template API function that allows to place the search facility virtually anywhere on a site. Have a look at the live Demo to see the instant search in action and read all about this great extension’s features on its Documentation pages. This extension is a must-have that helps your customers to make a purchase decision. It is available on WooThemes. Hi I purchased woocommerce search plugin which does what I want it to do, but the search results shows products that have visibility set to hidden which I need to be hidden even in the search results can you help me with this?? How are you hiding the products, i.e. what tool are you using to manage the visibility? Most likely you are using a tool which is not integrated with the search extension.